Are you looking for Propane Cylinder Delivery in Barnegat, NJ? 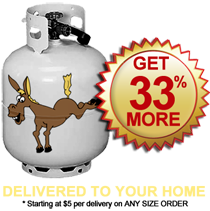 JackGas provides Propane Cylinder Delivery in Barnegat, NJ at fair rates and with great customer care since 1969. Summer or winter, we offer propane cylinder delivery in Barnegat, NJ to your home or office. During the summer we provide propane delivery for BBQ grills to make sure that your BBQ party will not get interrupted by low propane in your BBQ grill tank. At JackGas, we offer you two options: one is to come to our store location and have us fill up the propane tank for you. The other is to open a NJ propane delivery account with us and we’ll deliver the new propane tank directly to you. During the winter, when it is so cold outside, we provide propane cylinder delivery in Barnegat, NJ to your home or office for heating purposes. We also deliver propane to construction sites to help keep workers warm with industrial or commercial propane heaters. This way, you don’t have to leave the comfort of your home or brave a storm to keep your jobsite up and running. At JackGas, our commitment to providing excellent customer service is matched only by our commitment to keep you warm with propane cylinder delivery in Barnegat, NJ. At JackGas, we have reinvented the way that propane cylinder delivery in Barnegat, NJ is being refilled and delivered. Since 1969, we have been offering propane cylinder delivery in Barnegat, NJ as safe and efficient as possible. We offer a wide geographic coverage for our Propane Cylinder Delivery in Barnegat, NJ. When the JackGas propane delivery professionals fill up your tank, you can rest assured that it will last you for as long as possible since we fill up your propane tank to its full capacity. This way, you can enjoy this summer's grilling season or the winter season without unnecessary interruptions. JackGas - providing propane cylinder delivery in Barnegat, NJ for you.